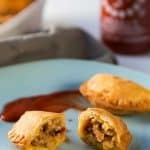 Freezer-friendly and easy Spicy Sausage Empanadas! 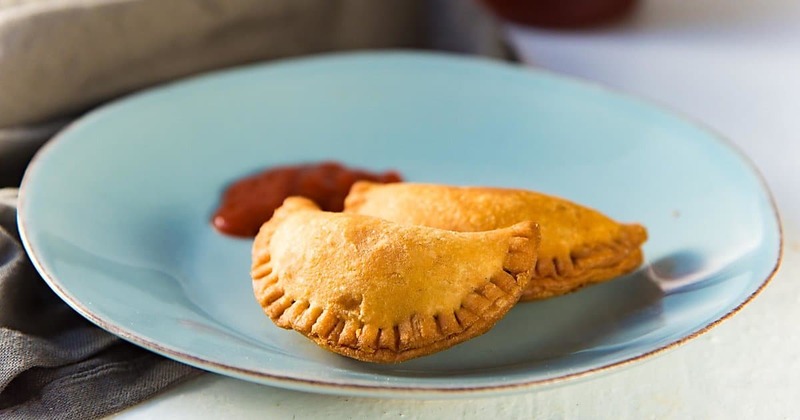 These hand pies are spicy, creamy, cheesy, and sure to be a hit at your game day spread! 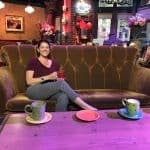 This is Dini from The Flavor Bender, back with another fantastic recipe to share with you! Game day is all about the snacks and drinks for me. 🙂 I’m not really into the actual game, but I’m all for making a party out of it! 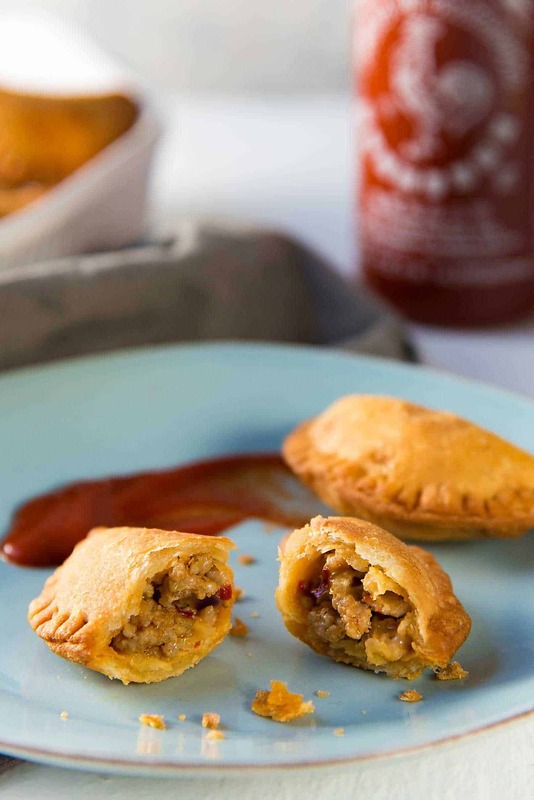 And these Spicy Sausage Empanadas are the PERFECT snack for any kind of party! These from scratch empanadas are filled with a spicy sausage and cheese filling, and they are really easy to make. I used a from scratch empanada dough that comes together easily. If you don’t want to make the dough yourself, you can substitute with a store-bought pie crust in a pinch too. I made my empanada dough with butter here, but you can use lard as well if you like. There will be a difference in taste, but regardless of how you make the dough, the star in this recipe is definitely the spicy sausage filling! These spicy sausage empanadas are freezer-friendly too. So you can make them ahead of time and freeze for up to a whole month. Plus, you can fry them directly from frozen. 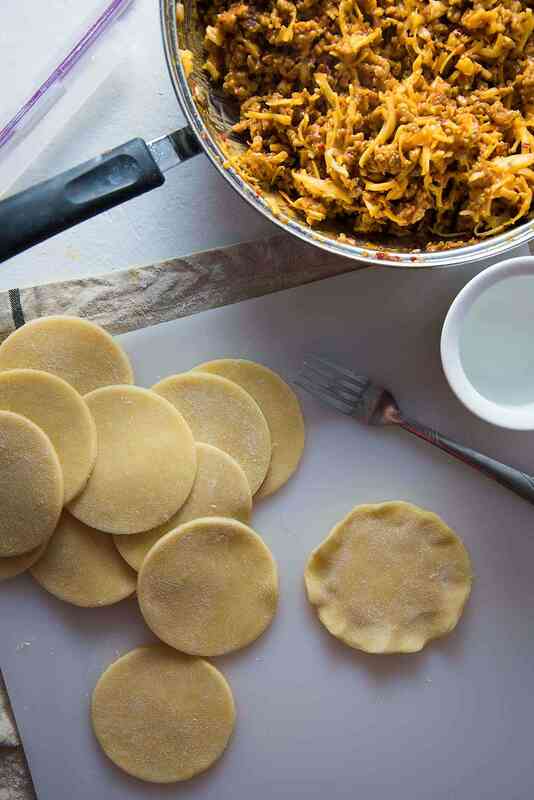 As long as you freeze them properly (lay out the empanadas in a single layer, with some space between each so that they don’t stick together), you’ve got a delicious snack on hand, ready to go, whenever you fancy! Heat 2 tbsp oil in a skillet. When the oil is heated, add the onions and saute until they are softened. Add the sausage meat and pepper flakes and cook making sure to break the sausage into pieces while stirring so that it isn’t one big clump of meat. Once the sausage is cooked, taste and season with extra salt if necessary. Add the cream, and stir to combine. Remove the cooked sausage from the heat and let it cool down to room temperature. Stir the cheese into the cooled down sausage filling. Set aside until ready to make empanadas. Make the empanada dough as written here, and chill the dough for at least 1 hour. Roll out the chilled empanada dough until it’s about 2 – 3 mm thick. Cut 3.5 inch circles from the rolled out dough. Fill the middle of each circle with a little sausage filling. Dab the edges of the empanada dough circle with water and fold over the pastry to seal in the filling. Press down the edges to seal, and use a fork to crimp the edges. Place the empanadas in one layer, on a baking tray. Keep it covered with plastic wrap and keep it in the fridge until you are ready to fry, IF you will be frying these within 24 hours. Heat remaining oil to deep fry the empanadas to 350°F / 180°C. Fry the empanadas in the hot oil, 2 minutes per side, until the pastry turns a golden brown. Drain excess oil by placing the fried empanadas on paper towels or newspaper. Fry the frozen empanadas for about 4 minutes per side, until the pastry turns golden brown (maybe slightly darker). Enjoy while hot with dipping sauce! TO FREEZE – cover the tray of empanadas with plastic wrap and keep the baking tray in the freezer until the empanadas are frozen (a few hours). Place the frozen empanadas in a container (freezer friendly), until needed. *If you like this recipe, leave a comment and rate it with some stars!!! Empanadas are one of my favorite foods! I can’t wait to make these this weekend! WOW!!! I love this!!! I love that has this spicy combo of flavors, I just like empanadas, LOL! YUM! What a fun appetizer!! Thanks for sharing!! I liked that this can stay up to a month! Easy on-the-go for snacking and partying and I love the spice and mix of ingredients! Oh my do these sound incredible!!! A perfect party food! The spicy sausage filling sounds so so good! I love everything about this finger food! Sausage is always a favorite of ours especially when we want a punch of flavor in a small bite. These are fun easy bites, freezer friendly too? Even better!! I am not really a fan of spicy sausage but I loved this recipe. It was so delicious that I am planning to make another batch to give to some friends. Thank you for sharing this. I love sausage spicy but not with a lot of fennel in mine! I love the sound of these. Yummy & fun to eat! Wow! These sound so good! Looks like I know what were having Saturday for dinner! These look so delicious! I love that you can make these ahead and freeze them, that makes entertaining so easy!